Hello all. Welcome back, this is a huge achievement for me to get two book reviews done in the space of 2 weeks, trying to get back on track for all of you following me for my book reviews. I know this is the same series as last week, but I could not help myself, I just love the Guild Hunter series too much. To check out my previous click the link : Archangels Enigma: book review I have included links to my other posts from the series. The cover features Archangels Raphael’s Consort Elena Deveraux, also known as the Guild Hunter. 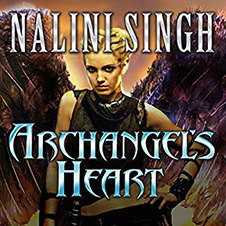 The american covers always features the full character, which helps visualise Nalini Singh’s books. This outfit is featured in the book, as you can tell she is always full equipped for whatever trouble will come up. I was really looking forward to this book because the series went back to Raphael and Elena. I had read mixed reviews before I started to read the story but I did not let that put me off. Who wouldn’t want to read about a mortal hunter who becomes the lover/consort of an Archangel, and then an Angel herself. This book only took me a total of 5 days to read and that was with short 1-2 hour burst reading sessions, I was captivated from start to finish. The book takes you to 2 years after Lijuan attempting to kill Alexander, a powerful Archangel (ancient), so that she can gain control. Not a lot had happened since then as everyone assumes that Lujian is either asleep or hiding until she further regenerates. “I don’t want luminous eyes” She said. “I want normal grey eyes that let me blend in, not silver eyes that make it obvious i’m immortal”. Raphael’s lips curved. “A pity about the wings then”. The book follows Elena and Raphael on a trip to meet the Luminata in Morocco. The Luminata have the right to call all the Archangels ( 11 of them currently) to Lumia for a meeting to sort out what has been happening in the world. This makes everything difficult from the beginning because Archangels should never be too close to each other for a long period of time, let alone bringing all 11 of them under one roof. Lujian Obviously never arrives. ( Audio Cover—–>). In the beginning of this book we also get to read more about Illium aka Bluebell, and his friendship with Aodhan which is stronger than Elena first realised. She gets to discover more about Aodhan as he is invited by Raphael to be Elena’s guard. I found the whole story overall very interesting, even though we do not get to see what happens with Lijuan, we discover more about Elena, while she discovers the truths behind what happened to her family, as well as finding out the secrets hidden behind the walls of the Luminata. There was more of a relationship shown in this book between friends and lovers. There was not a lot of action, however I understood Elena, and understood more of the angel history.